One of the pleasures of hosting a website filled with genealogical records is connecting with family members I might not otherwise know. Neither of my parents were diligent about maintaining family connections, save for periodic trips to Santa Cruz or Los Angeles to visit my grandparents. On very rare occasions, we would go on trips that might include a visit to a great uncle or aunt, but these were the exception, once in a lifetime events that were almost never repeated. Consequently, I grew up able to count the family I knew on my fingers, unaware what I was missing in the common threads I shared with great aunts and uncles, cousins, and their various husbands and wives. My recent post on Ryland Drennan led to a new connection that reminded me of the value of shared heritage, and how delightful it can be to reestablish relationships with extended family. A couple of weeks after posting the item, which lamented a lost family photo, my father’s first cousin, Janet Martini, paid one of her occasional visits to the site and spotted the post. Janet mentioned she had several family photos of Ryland, which she subsequently scanned and sent to me. 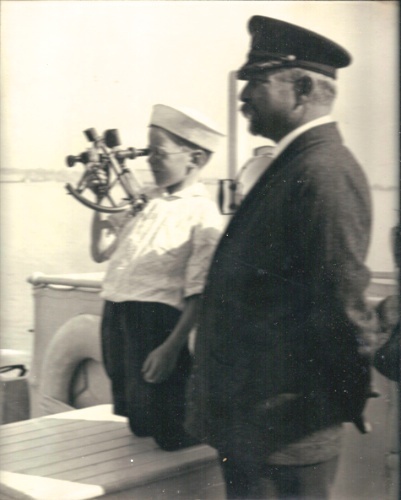 In addition to a copy of the lost photo, she included an image I had never seen, featuring Ryland on the deck of a ship with his young nephew, Fernald Byrne. Fernald died tragically at age 15 on the Giant Dipper roller coaster at the Santa Cruz Boardwalk, and is somewhat of a family legend for that terrible event. Fernald Byrne on deck with his uncle, Ryland Drennan circa 1920. Looking at the photo of Ryland, it’s a little less glamorous than I remembered, but still a striking image. The cigarette in his hand gives evidence of just one vice which may have helped end his life at the ripe young age of 50. But I’m more enchanted by the image of uncle and nephew sharing a happy moment together on deck, and grateful to have connected with a not-so-distant cousin, who went out of their way to share some materials that can now be seen by other family members. of any of the other members of the family, You are very fortunate to have so many family photos that were labeled. I guess you know that Isabella Frierson Garland grew up on the plantation in Sumter County that is featured in the book, “Life on the Old Plantation” by I E Lowery, an ex-slave who had lived there. I grew up in Sumter and now live in Columbia, SC. I am a very part-time amateur genealogist. Your site is great! Thanks for stopping by, and for taking the time to comment. It’s a good thing to have ancestors who were a little obsessive/compulsive, as it sure makes for better identification of old photos. Alas, my Garland connection is minimal. 99.99% of all Garland data is researched by Wayne Garland, and his work also appears on the site. I’m forwarding your info to him, and I’m sure he’ll be in touch. I’m descended from the Dukes and the Woods. I enjoyed looking at your web site. I am descended from the sister of Sewell Fogg Graves. I have pictures of his parents, John and Delilah Smith Graves, and some of Sewell as well. Please contact me if you are interested! Both Thomas and William Fernald owned the two islands that now comprise the Portsmouth Naval Shipyard. I am descended from both of these men. And, I descend from Thomas twice, if I have that second lineage correct. (Am still proving that second line) Thomas had a son named Hercules and a grandson named John who married his cousin Margaret daughter of Nathaniel, William’s son, and his wife Margaret Tripe. 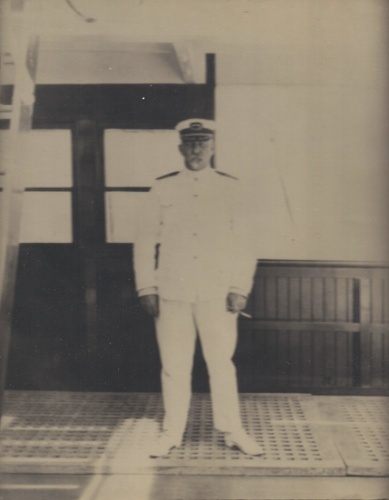 Their daughter Jane Fernald married Capt. John Seavey and 2nd John Steven’s, Jr. I descend from them. John Steven’s, Jr. was a Rev. War Soldier and I’ve proven that lineage. A major problem has been that two prominent books: “Soldiers and Sailors of Kittery and Eliot” and “Soldiers, Sailors and Marines of Maine” list this John Steven’s, Jr. as having a second wife named Miriam Lillis. This is not true! I’ve since found two deeds in Alfred, Maine signed with the names of both John Steven’s and Jane, his wife up into 1833 and 1835. And, we know, Jane (Fernald) (Seavey) Stevens didn’t die until 1836. John Stevens, Jr. b. 1758 and Jane Fernald, Seavey, Stevens are buried in the First Christian Church Cemetery on Haley Rd. in Kittery Point. Many of the people buried in that first section of the cemetery are related to me and you. Jane Fernald had two sons by Capt. John Seavey. They were John Seavey and Stephen Seavey. John was also a captain and died in Boston. After she married John Steven’s, Jr. she had, Charles, Hannah, Jane, and Miriam. Charles married Elizabeth Parsons and they had 3 children. Hannah Stevens married 1st. David Marston of Portsmouth and they had two daughters. They were: Hannah and Lydia Jane. Hannah (Stevens) Marston married 2nd Theodore Parker, Esq. Miriam Stevens married John Jewell. Jane Stevens married her 1st cousin, Elder Mark Fernald. (You can download his book which is essentially a diary of his life during that time-It’s free to download at Google Books). Thanks, Eileen. Great to hear from you, and interesting stuff! I wonder why both books list Miriam Lillis as a second wife? I’ve browsed with interest the Mark Fernald book on Google Books, but it’s been several years.